In the summer of 2012 I met up with Christian casually discussing ideas around developing modern educational content. Our chat eventually evolved into possibly creating modern versions of popular fairy tales for children on mobile devices and have well known actors with great voices read the stories and finally to donate parts of the revenue generated to helping children around the world. I asked Christian if he thought his father would potentially read a story for the project, “Let’s find out” he said and picked up his phone and called his father, Sir Roger Moore KBE, who accepted the challenge right there and then. With a commitment like that in hand – I just had to do it! Sir Roger Moore being a Unicef Ambassador as well as an Ambassador for Hans Christian Andersen it all suddenly seemed rather obvious and eventually it all came together not least thanks to Sir Roger’s invaluable support and dedication to the project. Development wise this was not a project I was able pull off on my own though so I got in touch with Simon and Jacob at Kiloo in Denmark who sort of liked the idea and eventually agreed to partner up and help me make it happen. Initially we tried using internal resources combined with some freelancers, but after a lot of trial and error it became apparent that we were never going to get the quality and consistency in the product we wanted, there were no shortcuts – we had to do it right. We ended up establishing GivingTales kft in Budapest, Hungary where we have a wonderful studio with an incredibly talented and motivated team developing what we like to think are the most beautiful fairy tales for children and adults alike the world has ever experienced. 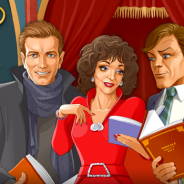 Through Sir Roger Moore we also managed to get support for story reading by some remarkable individuals including; Ewan McGregor, Stephen Fry, Dame Joan Collins, Joanna Lumley, Sir Michael Caine and more as we rolled out some of the most popular fairy tales ever written by Hans Christian Andersen. The ambition is to build a sustainable product which can produce high quality content for children around the world for years to come in several languages and at the same time make consistent and meaningful contributions to charities protecting and educating children around the world. In 2016 we have launched corporate programs to enable companies, initially in the travel and leisure industry, to licence GivingTales video versions and apps for their guests to enjoy when on holiday with their children. Make sure you visit http://givingtales.com and download the free app and let me know what you think.